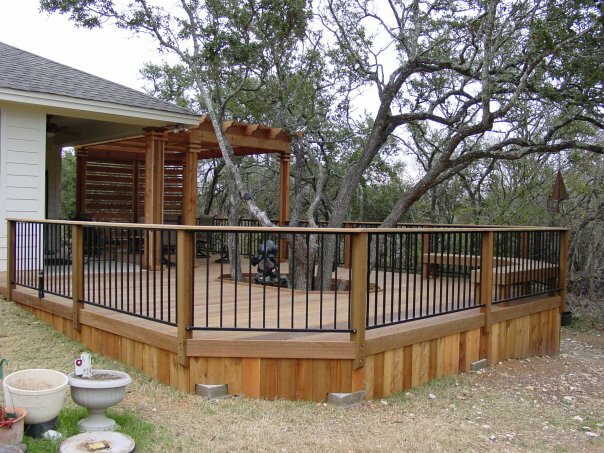 Archadeck of Austin cares about the natural landscape and enjoys working with existing trees within the area where you may be considering adding a deck or other outdoor living structure. We like to design your outdoor structure to fit your existing trees instead of clearing the area. 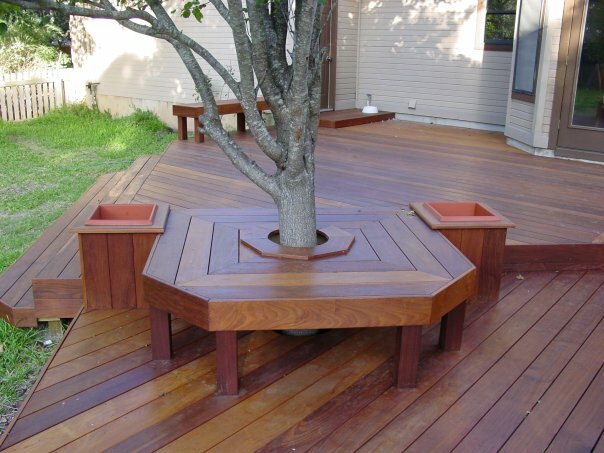 Not only does this keep the beauty of your landscape intact, it makes for an interesting design feature of your deck. 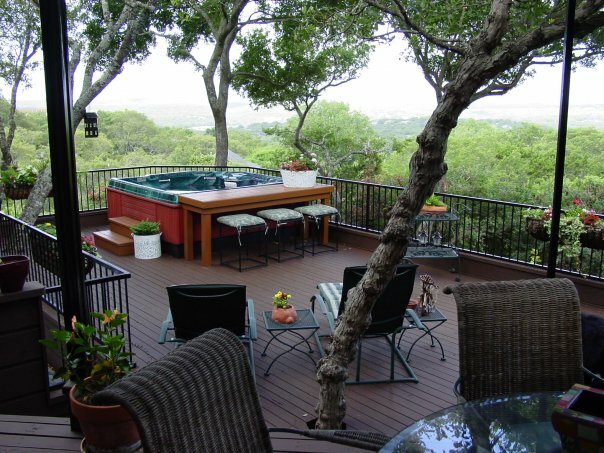 One example of the way we make every effort to integrate any existing trees of worth into your outdoor living design is a stunning Tigerwood deck flanked by double flagstone patios on either side that we completed in the Oak Hill community in South Austin. The area where the deck and double patio lies contains some majestic, mature conifers that we were able to incorporate into the layout and design of the structures to preserve the beauty of the landscape and not harm the trees. The foundation of any good outdoor structure design begins with working with the landscape when possible. Many builders set off on their projects by initially “clearing off” the entire area where an outdoor structure is to be built. We like to look at all the individual characteristics of each landscape, as well as the home, when we design outdoor structures. Mature trees can take years, even decades to reach a size where they provide optimal shade in a homeowners backyard. With this in mind, combined with the trees’ beauty, why would clearing off the area of trees be the automatic choice or the right choice? Leaving the tree(s), and working the design around the tree is sometimes the glue that holds the entire design together. It adds visual interest, adds shade without having to use an awning or other protective covering, and it opens the door to so many stunning possibilities. One way we make use of an integrated tree is to add built-in bench seating around the tree. This outcome is similar to the style of a French Tete-a-Tete chair or bench from a by-gone area. It provides an intimate place to strike up a conversation and adds much-needed seating when entertaining outdoors. 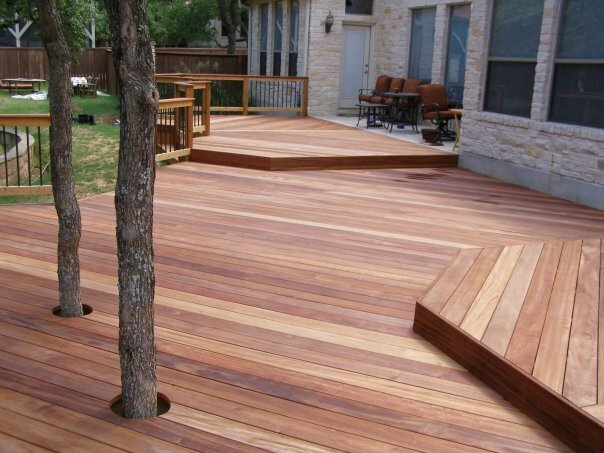 Contact Archadeck of Austin to learn more about integrating a tree, or trees into your deck or other outdoor design. 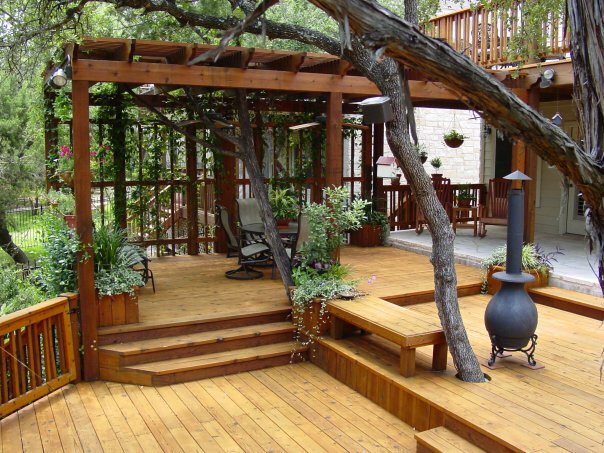 Incorporating existing trees into your deck may be easier than you think. We specialize in creating an outdoor space that is unique. Our outdoor spaces are designed to fit your individuality and lifestyle in a way that is certain to make heads turn to take a second glance. See more unique design features for outdoor living structures by visiting our design feature gallery located on our website. 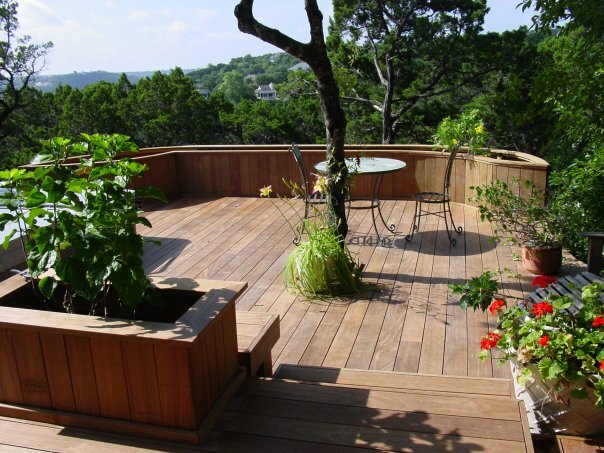 We also have a plethora of inspirational deck photos from past projects to view on our many deck photo galleries, also located on our website. This entry was posted on June 15, 2012 by austinporchandpatio. It was filed under Decks, Patios and was tagged with Archadeck of Austin, Archadeck of Austin design, Austin deck builder, Austin decks, Austin tiger wood decks, Custom design rendering, Integrating trees into your Austin TX deck, Integrating trees into your Austin TX outdoor structure design, Tiger Wood decks Austin, Unique deck designs Austin TX, Unique outdoor structure designs Austin TX, Unique patio designs Austin TX, Utilizing special design features on your Austin TX deck.